There are two events that send my delicately balanced work schedule into the realms of chaos. The first is a deadline. The end of the semester is an excellent choice but an upcoming conference also makes a great substitute if the date isn't working with you. The second is a brand new seminar. Preparing slides to lecture on a new topic (that is, one for which it's not possible to cannibalise previous talks) is immensely time consuming. An unkind person might suggest here that I tend towards perfectionism, but I rebuke this by pointing out pictures take on a whole new level of importance when your audience is pretending really hard not to speak English. Also, I have an artistic vision and you're not allowed to mess with that, yo! It is also a sad fact that people take pleasure, nay DELIGHT, in combining these events into one large chaos bomb. Such it was that the world found me awake at 2 am on the last day of my 33rd lap around the sun, putting together the last of my slides for that morning's seminar. The semester end loomed large at the end of the month which meant it was a golden moment for someone to suggest a guest lecture would be perfection in a 90 minute time slot. But, not to worry! The slides were now drawn and all that was left to do was sort their order and animation flow. I went to bed. For some entirely unexpected reason, getting up the next morning was a struggle. I was supposed to be in my Japanese class by 8:45 am, but with the homework undone, the test unrevised and my slides still requiring final touches, I took a management decision to cut my losses. And the class. Even with this guilty concession, I found myself running late for the seminar. I sprinted across campus, tumbled into the lecture room and wished I'd had the foresight to tuck a bottle of water in my bag. Two minutes later, I would have switched the bottle of water for remembering my laptop's power supply. I had a spare plug in my office, but that was on the 9th floor of the building, whereas the seminar room was on the 4th. With a single elevator servicing all 11 floors, such excursions had to be carefully timetabled events. But, not to worry! My battery was fully charged and would probably last through a presentation. Probably. My first slide flashed up on the screen and I attempted to look like someone who had their life in order. I began to describe the use of computer simulations in astrophysics, relieved that my slides at least looked the part, even if the speaker looked as if she had a hedge as a close cousin. But … not … to … worry… I focussed on the talk while I tried to plot a course of action. "There are three main groups of astrophysicists: observers, instrument builders and theorists." "One of the problems observers face is they can only see the Universe from one position; the Earth." Maybe I could run upstairs to my office? No, it would take too long and I don't remember if I have anything there either…. "In reality, we cannot turn-off different physics. 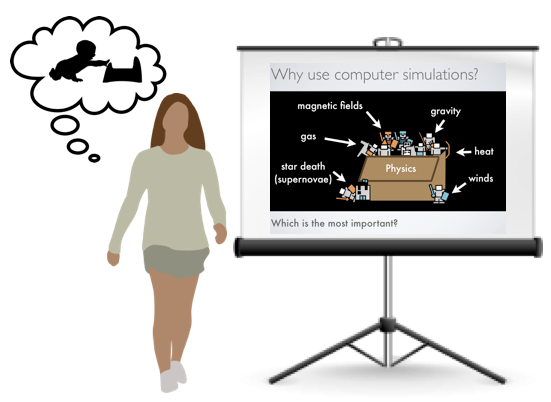 But in simulations, physics is like a giant toy box." Definitely no time to go to the campus store… I'm wearing black trousers... that'll have to do. This was the scientific equivalent of the thespian phrase: 'The show must go on'. And on it did go while I silently admitted the irony of such a pubescent mistake occurring the day before my 33rd birthday. To anyone who has had 'Young at Heart ' on replay around their birthdays, remember an eternally youthful mind comes at a price. The seminar ended. Everyone applauded. I answered questions, calmly took my leave and … sprinted back to my apartment to throw myself, work bag and the cat who had appeared under my feet, into the bathroom. "Why don't YOU get periods?" I demanded to the yellow-green eyes staring up at me. You've gone mad. Will this affect my food supply? Freshly clothed (the damage had been mercifully minimal but the day required a new front), I returned to campus and met with my graduate student. Cool, calm and collected; that's me. "So, what mass are you finding for the star forming clouds?" Adulthood: Same mistakes. More practised cover-up.